Suppose your company owns a number of cloud computers and needs to run a number of processes on those computers. Assign each process to a computer under the following 4 constraints. The CPU power of a computer must be at least the sum of the CPU power required by the processes assigned to that computer. 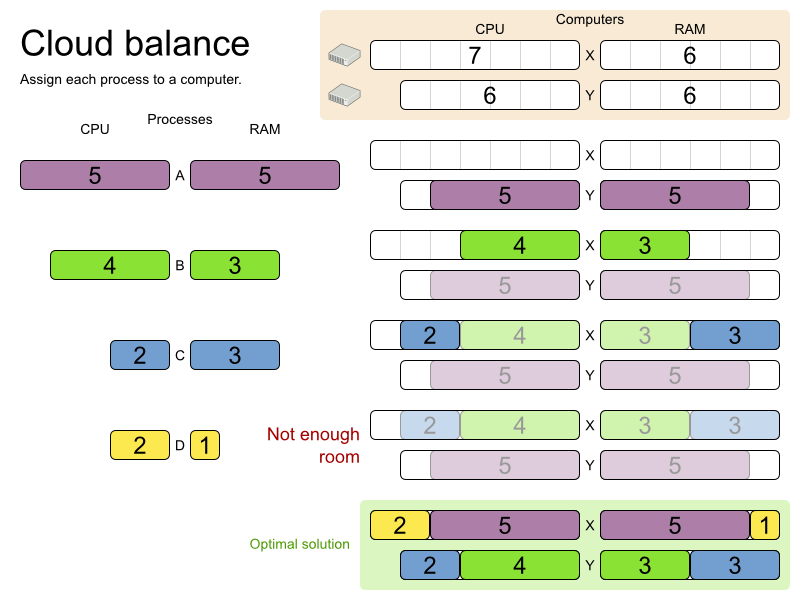 The RAM memory of a computer must be at least the sum of the RAM memory required by the processes assigned to that computer. The network bandwidth of a computer must be at least the sum of the network bandwidth required by the processes assigned to that computer. Each computer that has one or more processes assigned, incurs a maintenance cost (which is fixed per computer). Minimize the total maintenance cost. The simple algorithm used here is the First Fit Decreasing algorithm, which assigns the bigger processes first and assigns the smaller processes to the remaining space. As you can see, it's not optimal, because it does not leave enough room to assign the yellow process D.
OptaPlanner does find the more optimal solution fast, by using additional, smarter algorithms. And it scales too: both in data (more processes, more computers) and constraints (more hardware requirements, other constraints). So let's take a look how we can use Planner for this. cb-0002comp-0006proc has   2 computers and    6 processes with a search space of      64.
cb-0003comp-0009proc has   3 computers and    9 processes with a search space of    10^4. cb-0004comp-0012proc has   4 computers and   12 processes with a search space of    10^7. cb-0100comp-0300proc has 100 computers and  300 processes with a search space of  10^600. cb-0200comp-0600proc has 200 computers and  600 processes with a search space of 10^1380. cb-0400comp-1200proc has 400 computers and 1200 processes with a search space of 10^3122. cb-0800comp-2400proc has 800 computers and 2400 processes with a search space of 10^6967. Computer: represents a computer with certain hardware (CPU power, RAM memory, network bandwidth) and maintenance cost. Process: represents a process with a demand. Needs to be assigned to a Computer by Planner. 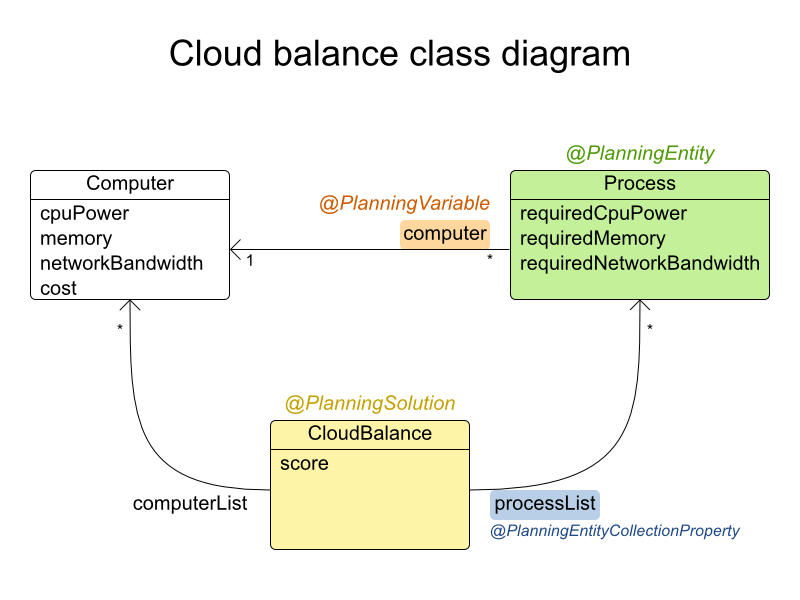 CloudBalance: represents a problem. Contains every Computer and Process for a certain data set. Planning entity: the class (or classes) that changes during planning. In this example that's the class Process. Planning variable: the property (or properties) of a planning entity class that changes during planning. In this examples, that's the property computer on the class Process. Solution: the class that represents a data set and contains all planning entities. In this example that's the class CloudBalance. System.out.println("\nSolved cloudBalance with 400 computers and 1200 processes:\n"
Build the Solver based on a solver configuration (in this case an XML file). Load the problem. CloudBalancingGenerator generates a random problem: you'll replace this with a class that loads a real problem, for example from a database. The only non-obvious part is building the Solver. Let's examine that. Score configuration: How should Planner optimize the planning variables? Since we have hard and soft constraints, we use a HardSoftScore. But we also need to tell Planner how to calculate such the score, depending on our business requirements. Further down, we 'll look into 2 alternatives to calculate the score: using a simple Java implementation or using Drools DRL. 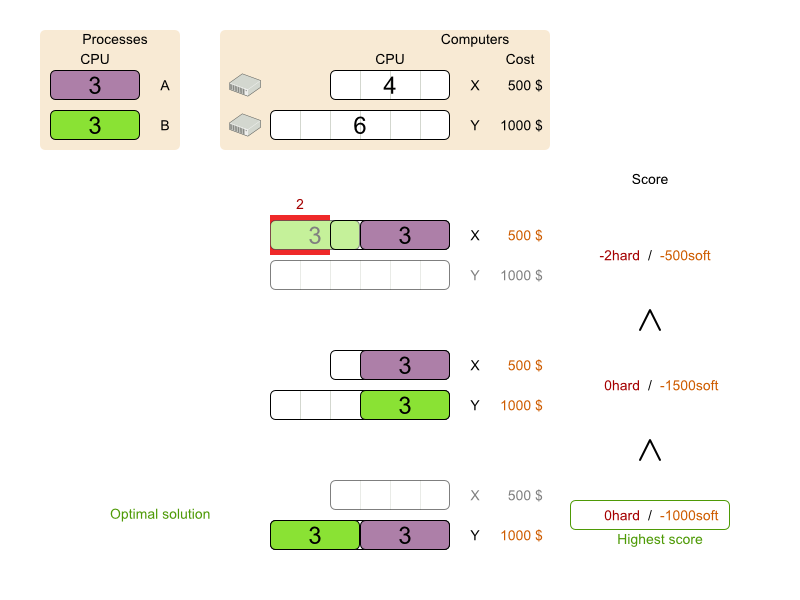 Optimization algorithms configuration: How should Planner optimize it? Don't worry about this for now: this is a good default configuration that works on most planning problems. It will already surpass human planners and most in-house implementations. Using the Planner benchmark toolkit, you can tweak it to get even better results. Let's examine the domain model classes and the score configuration. The class Computer is a POJO (Plain Old Java Object), nothing special. Usually, you'll have more of these kind of classes. The values that Planner can choose from for the field computer, are retrieved from a method on the Solution implementation: CloudBalance.getComputerList() which returns a list of all computers in the current data set. We tell Planner about this by using the valueRangeProviderRefs property. The class CloudBalance implements the Solution interface. It holds a list of all computers and processes. We need to tell Planner how to retrieve the collection of process which it can change, so we need to annotate the getter getProcessList with @PlanningEntityCollectionProperty. The method getProblemFacts() is only needed for score calculation with Drools. It's not needed for the other score calculation types. Planner will search for the Solution with the highest Score. We're using a HardSoftScore, which means Planner will look for the solution with no hard constraints broken (fulfill hardware requirements) and as little as possible soft constraints broken (minimize maintenance cost). One way to define a score function is to implement the interface SimpleScoreCalculator in plain Java. Just implement the method calculateScore(Solution) to return a HardSoftScore instance. Even if we optimize the code above to use Maps to iterate through the processList only once, it is still slow because it doesn't do incremental score calculation. To fix that, either use an incremental Java score function or a Drools score function. Let's take a look at the latter. Each Process belongs to a Service. A computer can crash, so processes running the same service should be assigned to different computers. Each Computer is located in a Building. A building can burn down, so processes of the same services should be assigned to computers in different buildings.